In the old town of Hojo, where I live, you have to always remember to stay properly dressed, even when you are inside your own home. That`s because the neighbors do not knock before entering- they just open your front-door and come in ! ( when I first moved in, I was frequently caught with my pants off before I learned this lesson!). When they do come in, however, ( and this is surprisingly often), they almost always bear with them some sort of gift- freshly picked home-grown fruits or vegetables, or some other home-made treats. The other day, my next-door neighbor opened our door in the early morning ( and actually caught me offguard in my underpants once again!) 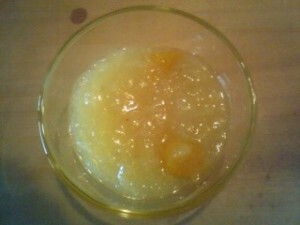 and handed me a little dish wrapped in cellophane- freshly made Yuzu Jam. She said it was her family recipe, handed down from generation to generation. It was made using fruit which grows in her garden ( just about every garden on my block has such trees). This was in fact perfect timing as I was just about to fix breakfast. When I was ready to eat, I spread a little jam on a slice of toast and took a bite expecting something harshly sour. Chewing cautiously, I quickly realized that this jam was mild and deeply flavorful. I spooned out some more on the toast and ate with gusto. I ended up nearly finishing the whole bowl in one sitting. After breakfast I walked over next-door to say thank you and to ask for the recipe. I`d like to share it with you. It is remarkably simple, but does require a little patience. Peel your yuzu and break them up into segments. Remove all the white strands from around the segments. Wash the remaining PACKETS ( I mean the segments with the pulp squeezed out) in water in a bowl. Rinse away most of the water. Heat the packets ( with no extra water but wet from the rinsing) in a sauce pan over low heat. Though I have read that they originally come from the upper-reaches of the Yangtze River in China, Yuzu trees can now be found all over Japan ( south of Aomori Prefecture). As I have already said, they grow in Tsukuba and its vicinity in abundance. Varying in color ( from lemon-like yellow to mikan-like orange) and in size ( from tangerine-size to that of a grapefruit), I sometimes have trouble differentiating them from Tsukuba`s other winter citrus fruit. Since each yuzu tree bears many fruit, there are always more than one can actually use ( even though the Japanese have so many ways of using them). 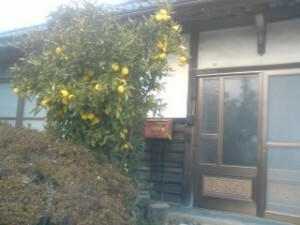 That is why it is perfectly normal to receive gifts of yuzu from people with these trees. I have been getting them for the past two weeks ( by the bagfull) and have been using them in various ways- for example today, on the winter solistice, I put some in my bath- it was a tingly experience!